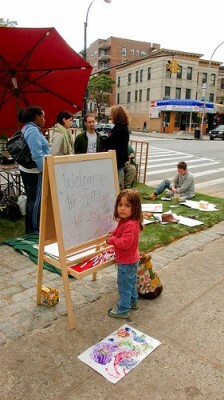 Browse: Home /	Community Building, Events, LIVABLE STREETS, Public Places / Park(ing) Day this Friday, September 18th! 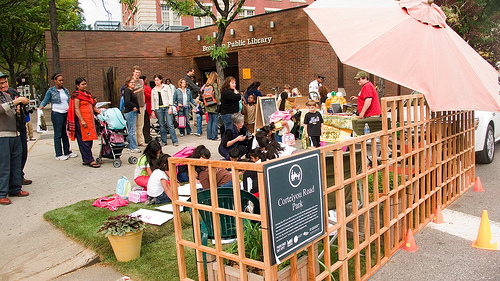 Ever wonder what our community could do with 120 square feet of outdoor space? Bring friends and family along to find out as Sustainable Flatbush hosts our 3rd annual Park(ing) Day event on Friday, September 18th, from 9am until 6pm. To raise awareness of how public space is allocated in our neighborhood, we will transform an unremarkable parking spot into “Cortelyou Road Park”: an urban oasis with grass, lawn chairs, music, art supplies, games, and good conversation for all to enjoy, at the corner of Cortelyou and Argyle Roads, in front of the Public Library. 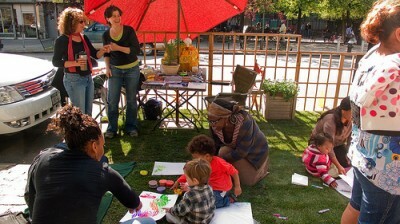 Two sustainable craft businesses based in the NYC area – Garbage of Eden Design and RePlayGround – will teach free creative workshops on fashioning fun stuff out of garbage. We invite you to bring your favorite empty cereal box or designed scrap paper to personalize your crafts. Jewelry made from plastic bags and yogurt containers as well as kits to make projects from scrap will be on display. You could even win a food gift basket from the Flatbush Food Coop, which is also graciously providing free snacks throughout the day! Join us for this international event at the level of our local neighborhood. Meet your neighbors and those working within our community who strive to make it a more livable place. So bring your own mug and don’t miss the daylong fun!